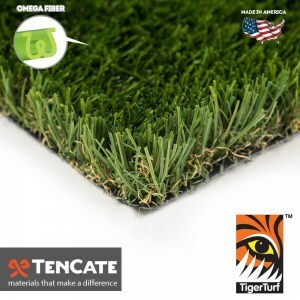 TigerTurf artificial grass products are beautiful, resilient, and safe. Our products last for decades, can withstand any level of foot traffic, and can tolerate any weather condition. 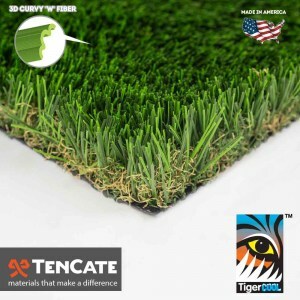 We have the widest range of synthetic grass products available, making our products perfect for any landscaping project. Our products don’t just look real, they are soft to the touch. Each blade is perfectly cut, then continually rolled and stretched to strengthen each synthetic yarn, until each fiber is as thin and elegant as natural grass. After the blades are treated with advanced UV resistant technology, we go through a rigorous tuft binding process that injects these blades into an environmentally friendly backing. This turf backing can resist thousands of pounds of resistance per square inch, the strongest backing in the industry. All TigerTurf products are certified lead-free so that you can safely enjoy our turf for years to come! The latest in artificial turf cooling technology. Created by TenCate, a worldwide innovator of space-age yarns for NASA and Boeing, TigerCool® yarns are engineered with heat reflective color pigments and advanced U.V. inhibitors that reduce surface temperatures. 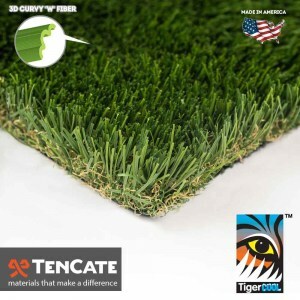 A series of solar panel tests indicate that artificial grass featuring TigerCool® technology successfully reduces turf temperatures about 15 percent and around 17 degrees – that’s a difference that you can feel! Don’t let the heat interfere with your life. TigerCool® makes any outdoor event a comfortable and pleasant experience. It’s perfect for any front yard, backyard, commercial property, public park, or municipality. Like all of our turf products, it’s safe for children and is pet friendly. TigerCool® is now featured on the majority of our best-selling products. Our products are guaranteed to last while you cool your heels on our turf for years to come. Just look for the badge and experience the difference for yourself! 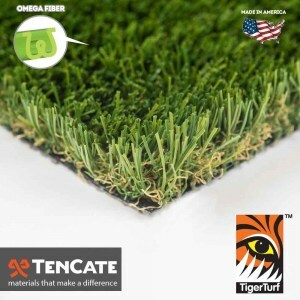 Check out some of our TigerTurf products! Using the most advanced fibers through our direct partnership with TenCate, a global leader in state of the art synthetic materials.